Very good handling and a comfortable ride. 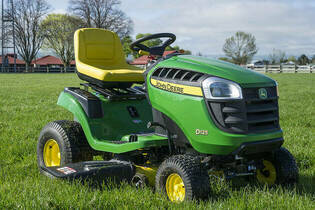 John Deere mowers significantly more reliable than average according to our survey. Some grass clumps left behind when mulching. Mulch plug is a little stiff to fit. Wide turning circle so takes a few stabs to mow around objects. Manual blade engagement rather than electric PTO switch like most modern mowers.